Gothic Slam were a thrash metal band in the late 80's/early 90's based in Hoboken/Jersey City, New Jersey. They released 2 acclaimed records of groove-laden thrash at the height of thrash metal popularity, "Killer Instinct" for New York based Torrid Records, and "Just A Face in The Crowd", which saw major label distribution through the Sony/Epic distribution network. Gothic Slam were known for the intensity of their live shows, and were regulars at "L'Amours" in Brooklyn and "Streets" in New Rochelle, New York, where they were wildly popular. The cover photograph for "Just A Face in The Crowd" was shot at "Streets", and featured the crowd at one of their shows. The band members were placed in the photograph after the fact, signifying the fact that they thought of themselves as kids in the crowd, a street level respect that kept them a constant draw wherever they played. Originally named "Stryker", the band changed the name shortly before their 1st album was released. 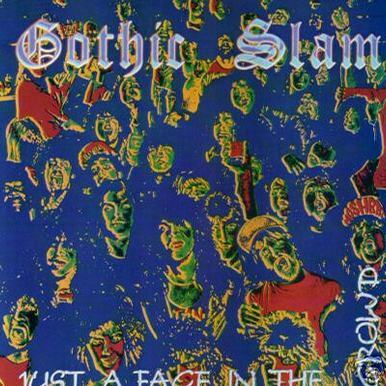 Though they never achieved major label success, Gothic Slam were respected by their peers, and had fans who were wildly devoted. The video shot for "Who Died And Made You God?" was regularly featured on MTV's "Headbangers Ball", with members of the band even making an in-studio appearance once. "Just A Face in The Crowd" contains a cover version of "Thunder And Lightning" by Thin Lizzy, reportedly cited as the best ever cover version the remaining members of the band had ever heard.